little (green) hat, big world. Just a snippet of what I wore out to celebrate the crazy holiday known as St. Patrick's day. I broke out my fancy items, including my mini bowler hat and green mustache(see instagram pics below). There was no green beverages had, but my beau and I were were decked out. 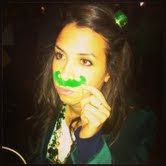 Hope you had a great St. Patty's day! My giveaway ends tonight at midnight!! Still time to enter here! completely in love with that green blazer!!! so perfect for st patty's! love the new layout. I had a similar hair clip that I wore this past weekend. Your blazer is perfect! haha thanks! I had to include the green mustache, it was a hit out!